This is the first of several essays published by the Congo Research Group(CRG) at the Center on International Cooperation in reaction to a nationwide poll conducted by CRG and the Bureau d’Études, de Recherches, et Consulting International (BERCI). You can also download this essay here. This survey by the Bureau d’Études, de Recherches, et Consulting International (BERCI) and the Congo Research Group (CRG) is an exciting and interesting exercise. As a researcher in the Congo who started in 1959 I have always been astonished at how open, serious and forthcoming the Congolese of all classes have been in response to my questions despite the fact that I am a white American. I think this somewhat astonishing experience is relevant to a public opinion survey – it argues forcefully that people feel they can express themselves freely and that the results can therefore be trusted –– and the fact that 97,5% of those asked to take an hour to respond to the questions in this survey did so is also a testament to that. Moreover, BERCI is a highly respected Congolese research organization. It has been trusted to undertake surveys by major international organizations, for instance the World Bank and governments like that of the United States. The fact that it is entirely led and run by Congolese personnel gives it, in my view, considerable added credibility. People – like me – who carefully follow a country’s political evolution inevitably form broad opinions. They may be called prejudices, but that is unfair since they have spent a lot of time seeking “reality” and analyzing the information attained; maybe they should be called “post-judices.” However, I rarely have the opportunity to confront these notions with hard data. My goal in analyzing the results of this survey is therefore to check some of my firmly held views. Are they supported? My most important conclusion is that the opinions reflected in the survey have reconfirmed my admiration for the sagacity of the Congolese citizenry. They have taken some very clear positions but they show no fanaticism and they reveal a great agreement on certain key issues. There is a “Congolese citizen opinion”. Some members of the political elite will be very sorely disappointed by these results; I very much hope they will not allow their personal disappointments to allow them to cry foul. As leaders of the Congolese, even if let down, they will hopefully see in this survey proof of the political maturity and national cohesion of the citizens they hope to lead. During my first field trip (1959-61) in the Congo I was focused on the independence struggle, political mobilization and the critical May 1960 elections that produced the first Congolese national and provincial governments. Studying those elections, I was impressed not only with the commitment of the Congolese to participate but also with the intelligence – indeed the sophistication – of these citizens in how they voted in what for most was their first election. This view – not usually shared either by many members of the Congolese elite or Western analysts – was confirmed for me every time the Congolese public was given a chance to vote in a relatively free election. The 2006 election is another example of commitment and sophisticated electoral behavior. The Congo had only recently (2003) emerged from a geographic and political division into almost equal parts. Roughly a diagonal line from the northwest to the southeast had created two Congos – one Kinshasa-controlled, the other “rebel”-controlled. The run-off in the presidential vote pitted Jean-Pierre Bemba (a former “rebel” leader) against Joseph Kabila (the sitting president) and the result was almost an even split of the country. All sorts of ethnic and linguistic reasons were forwarded to explain this result. My explanation was very different; almost all the Congolese had voted in the same manner: They had overwhelmingly rejected the leaders who had ruled them – very badly in my view – for the past approximately ten years. The Kinshasa controlled areas voted for Bemba and the “rebel” controlled areas voted for Kabila. Further, less the 10% of the National Assembly membership was returned to power. What an impressive demonstration of the most fundamental purpose of democracy – leaders who have served the citizens badly are thrown out office! The 2011 election was so massively manipulated in favor of the president that no serious analyst of the Congo has viewed them as anything but stolen. Nonetheless, they also present an example of the Congolese public’s sophisticated understanding of the political environment in which they live. During the campaign period, Kabila’s ruling coalition managed to amend the constitution to make the presidential vote a one round, winner-take-all affair. This of course gave the incumbent – Kabila – a great advantage. The lesson learnt was that the main opposition leaders had to join forces and select a single opponent to face Kabila. Negotiations aimed at achieving this failed and so the consensus among analysts was that the electorate would divide along ethnic and regional lines and split its vote among the 10 opposition candidates for the presidency. But, if one looks at the very much undercounted opposition vote, this is not what happened. In areas where he had absolutely no ethnic affinities Tshisekedi – the most respected opposition leader – received massive electoral support. In other words, the opposition-inclined electorate did what its leaders failed to do – maximize their chances of gaining the presidency by concentrating their support on one candidate. Now, looking at the survey results, where does my respect and admiration for the political awareness and sophistication of Congolese citizens come out? The first variable I looked at was the support given to the constitution. It is overwhelming. 81% oppose any proposals to amend it – a critical question in the present political atmosphere. I have heard members of the Congolese elite speak in favor of restricting the vote of rural citizens to local elections because these “illiterate mamans” could not be expected to understand matters of state. This raises the question of whether support for the constitution – or as it is put in the survey “opposition to changing the constitution” – is different in rural and urban areas. The global difference is only 1.6%, well within the margin of error. Another way of assessing this is to compare Kinshasa (entirely urban) with all the other provinces, Kinshasa is 88.3% opposed, all the other provinces combined 80.4%. There is no country on earth where rural and urban citizens do not have somewhat different views – after all they have different interests – but the narrowness of these differences in the Congo should be seen as reflecting the successful creation of a national identity, of the existence of a broad interest in public affairs even by remote rural citizens and, finally, in a solid underpinning for real democracy. This survey therefore suggests two important conclusions for me: First, that the argument for restricting political participation is nothing short of manipulative and anti-democratic. Second, that despite the decline in education, political awareness is present in all classes of the citizenry. I expected great differences in responses between the areas of the country that have for the last twenty years suffered from continuing endemic violence when compared with those that have not. I selected five provinces that clearly fall into the endemic violence category – Tanganyika, North and South Kivu, Ituri and Haut Uele (the choice could be broadened or narrowed) and the average opposition to changing the constitution in these provinces is 80%. In other words, even this historically critical difference in the lives of these citizens has not had an impact on their view regarding this currently important question of supporting the constitution and opposing altering it. The same focus on the constitution and the rights it guarantees can be extended to specific questions. For instance, the constitutionally protected right to protest non-violently. Among others, youth movements have attempted to do so and been arrested as a result. Thus, the survey asks whether their right should be protected or whether this would create troubles – as it did in fact – and therefore they should stop. 57% of the respondents supported their right to protest and only 16% thought they should stop. Again, there is little difference between urban and rural voters, between the educated and those who are not, in their answers. It is of course interesting to compare support for the right to protest with participation in some form of protest. Needless to say, these are two very different propositions. Asked whether they have participated in any form of active protest in the last five years, only 7.6% affirmed having done so. But, when that is projected onto the whole population it suggests a huge propensity to actively join protests – if the population is estimated at about 70 million that means that over 5 million Congolese have joined some form of protest activity in the last 5 years. Notably, 78% replied that they had not participated. It would of course be further interesting to divide these global figures along the rural/urban axis and the violent/non-violent axis and here it would be interesting to add the age factor. The survey shows that men between the ages of 25 and 55 with university degrees participate in protests much more than the overall average, suggesting that the crowds in the streets are not just fueled by unemployed youth, but rather that a part of the middle class is willing to join often dangerous protest activities in order to achieve political change. It will be impossible to hold elections by the end of the year, as the constitution requires. It is also clear that little preparation has been made to have them take place in the near future. In fact, they are now scheduled to take place in 2018. How do the surveyed Congolese respond to this dilemma? 6% responded that they would join a protest if the elections were postponed – since this is now inevitable it shows a sense of realism. However, their propensity to protest goes up to 9% if the election was cheated and if both occurred – a likely scenario – then the propensity to protest goes to 22%. Thirty-eight percent state that they will not join protests even if either condition were to prevail. A sophisticated electorate alters its support according to changes in the political environment in which it lives. Unsophisticated electorates tend to be locked into loyalties that are unmovable – be they ethnic, religious, regional or ideological. What does the survey illustrate in that regard? As noted above, during the 2011 election a large portion of the opposition inclined electorate coalesced in support for Tshisekedi regardless of whether he and his party had a strong base in their region. Let us take one such region under consideration: Kongo Central (formerly Bas-Congo). In 2011 Tshisekedi’s support was 74% but in the survey, it drops to 18%. This area continues to be strongly opposed to Kabila who only received 7% support in the survey. So the de facto opposition to Kabila benefitted several opposition leaders with Katumbi gaining the most with 22%. When this survey was carried out in Kongo Central, Tshisekedi was very ill, said to be in a coma in a hospital in Brussels. So is this a permanent change in support? Not necessarily: Tshisekedi has recovered and returned to the Congo to a reception that involved hundreds of thousands Kinshasa residents. Given this analysis, if he again becomes a viable alternative to Kabila he may well again gain the support of the citizens of Kongo Central. The point is, the people follow political developments, adjust their positions accordingly and seek alternatives to leaders who are perceived as having misgoverned them and they do this by giving their support to those who are perceived as having the best chance – at any given moment – of producing change. The Congo Is An Internationally Recognized State – Is It Also A Nation? There are many conflicting definitions of nationhood – historic unity, ethnic, linguistic and religious communality, a common enemy – the list goes on. The Congo does not manifest many of these automatic indices of nationhood – with possibly the exception of a widely shared antagonism toward certain perceived foreign influences. It was originally created because of colonial conquest. It manifests neither ethnic, nor religious, nor linguistic unity. Yet, my observation has been that a growing sense of nationhood and pride in that national identity exists. How can the survey either confirm or undermine this view? In the opinions expressed, what are the major divergences and how deep are they? Are they regional, ethnic, religious, generational or based on class? If broadly speaking there are no significant fault lines, then the Congolese have gone far in constructing a nation. The first variable I looked at was opinions regarding the fiercely competing political parties: Across the board an average of 59,4% have a positive or more-or-less positive view of opposition parties. It is instructive to compare this with the opinion expressed regarding the parties making up the so called Presidential Majority (MP): almost exactly the same proportion of respondents had a good or more-or-less good opinion about them. One of the most fascinating results to come out of this survey is to compare this balanced view of the two opposed political alliances with the approval rating of their leaders. Taking the top five names of each side one sees a dramatic difference between approval for the alliances and approval of their leaders. For the MP the cumulative support given to their leaders (if political preferences remain the same on election day) is around 17%. For the opposition the cumulative support given is 61%. Why do the parties making up the MP gain a substantial amount of support while their leaders are given such minimal support? I can only suggest that this is linked to respect for the constitution. They have simply avoided following the constitution while the opposition leader have made following the constitution their principal demand. I have argued that the survey shows that the vast majority of the Congolese now have very similar opinions about a number of critical issues and that this represents the essence of they being a nation. This was not always so and if the point is granted it is a major achievement for a people now numbering around 70 million, divided into some 600 ethnic groups and covering a huge part of central Africa. However, I must bring up one reservation. Just because you and I have the same opinions, that does not mean we do not hate each other. It is well known that there are ethnic competitions and antagonisms in the Congo. Do they reach the level of mutual exclusion from the status of “being Congolese”? If they do, this undermines the elements of cohesion and nationhood that I have sought to illustrate. There are two parts of the survey that speak to this. On an optimistic note, Congolese overwhelmingly identify more with their nation than with their ethnic group––58,4% said they felt only Congolese or more Congolese than member of their ethnic group. The second part, however, is more sobering. In 2002, Tatiana Carayannis and I, again employing BERCI, conducted a relatively small survey which sought to answer this question and it showed that the overwhelming majority of Congolese – identified by their ethnicity – recognized each other as Congolese even when the respondents were being questioned about ethnic “opponents” or “enemies”. But, there was one striking exception; the Tutsi, Hutu and the Tutsi sub-group, the Banyamulenge. They were all rejected as genuine Congolese citizens when compared to other ethnic groups. The current survey has again focused on this exclusion. And today, as in 2002, these three ethnic groups are viewed as “different”. Asked if the Banyamulenge“ (they only exist in the Congo) are Congolese” only 23% agreed. Asked whether there are any Congolese Tutsi 24% agreed and Hutu 27% agreed. This can be compared with the 2002 results; Banyamulenge 26%, Tutsi 17% and Hutu 18%. There are of course very complex historical reasons for this exclusion, nonetheless the comparison shows a slight improvement in their acceptance. In sum, there is a broad national consensus on key issues and overall the opinions expressed are balanced and reasoned. But, the picture is not without some problems of acceptance and integration. It is my view that when Joseph Kabila initially became president (2001) he benefited from a substantial amount of popular support. However, this seems to have steadily declined resulting today in an overwhelming lack of support. Yet, in 2011 millions of Congolese voted for him – true, the election was stolen, but that does not eliminate the fact that millions voted for him. What does the survey teach us about this variable? Where does his popular support stand today? The survey has astonished me in the degree to which his standing has declined – to 7.8% in a hypothetical election. This lack of support is no doubt connected to another survey result; asked whether Kabila should resign if the constitutionally mandated elections are not held by the end of 2016, 79% supported the option that he should resign. These results are also striking when compared to the support for his chief rivals: Tshisekedi 18%, Katumbi 33% and Kamerhe 7.5%. I conclude that Kabila has lost support both in the urban and rural areas (although there are some regional differences) because he appears to refuse to give up power and therefore transgresses, in the apparent view of the respondents, the reverence given to the constitution. But, at the same time, this must be nuanced to a certain degree because the survey shows that Kabila’s job approval rating is much higher, around 44%. This suggests that people do not necessarily oppose him as a person––indeed, his approval rating is higher than some prominent opposition leaders––but want him to respect the constitution and the timing for alternans and therefore prefer others to him, a remarkably mature position. This survey has re-validated my long-standing admiration for what I think is the political maturity of the Congolese people. If only their leadership would respect and follow their views. 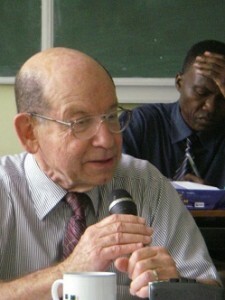 Herbert Weiss is Emeritus Professor at the City University of New York.